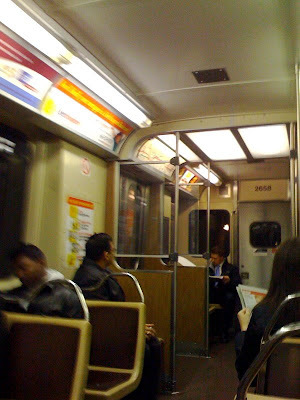 So yesterday I took the subway to the Loop. 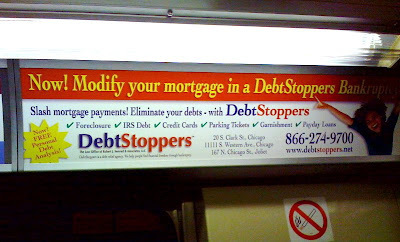 She has just [euphemism alert] modified her mortgage in a DebtStoppers Bankruptcy. She has [euphemism alert] shirked her responsibility to pay parking ticket fines for having violated municipal parking code. Rates will then rise and you will be subsidizing her parking violations. She is nullifying her commitments to previously signed contractual agreements by not paying her credit card balances...inflating the cost of everything to account for assumed losses for a certain expected /planned for percentage of non-payment by clients such as she. Losses to be written off by companies and banks with which you do business; thus you are now subsidizing additional aspects of her (clearly jubilant) life and lifestyle. Empowerment. 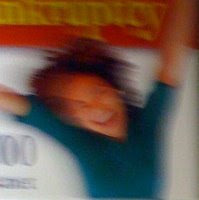 Empowerment!? ...as our country's morals, indebtedness and position as world economic power and democratic leader are dramatically weakened and undermined in that whoosh down the slippery slope. Love it! You've got that right.